Due to the efforts of W.E.B. DuBois, Americans began to take civil rights seriously. This coloring page features the first African-American woman poet published in the U.S.! Introduce your child to Miss Phillis Wheatley. Widen your knowledge of word culture with this fun page on traditional Korean clothing. Here's a word-scramble worksheet on Susan B. Anthony, one of the first women to rock the vote in a big way -- she got arrested for it! Get to know an important labor rights activist, Cesar Chavez, with this coloring page, featuring some important facts about him. Travel the world in this coloring page series of international places and cultures, from the cities of Europe to the rhythms of Cuba! This worksheet teaches about the Mexican tradition of mariachi music, which is Mexican folk music often sung by small bands of musicians. Learn more about this incredible woman—still inspiring activists over 100 years later—with this paper doll of Susan B. Anthony for kids. 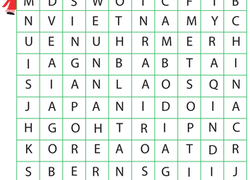 Bump up your kid's Asia Pacific geography vocabulary with a country word search. Can your child find all eight countries?